Forging produces pieces that are stronger than an equivalent cast or machined part. As the metal is shaped during the forging process, the internal grain deforms to follow the general shape of the part. This results in a grain that is continuous throughout the part, resulting in its high strength characteristics. Forgings are broadly classified as either cold, warm or hot forgings, according to the temperature at which the processing is performed. Iron and steel are nearly always hot forged, which prevents the work hardening that would result from cold forging. 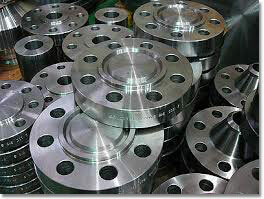 Work hardening increases the difficulty of performing secondary machining operations on the metal pieces. When work hardening is desired, other methods of hardening, most notably heat treating, may be applied to the piece. Alloys such as aluminum and titanium that are amenable to precipitation hardening can be hot forged, followed by hardening. Because of their high strength, forgings are almost always used where reliability and human safety are critical such as in the aerospace, automotive, ship building, oil drilling, engine and petrochemical industries. For more information or to receive a prompt aluminum price quote, please contact us at 800 398-4345 or submit the Request Information form on the right side of this page. Open die forging is performed between flat dies with no precut profiles in the dies. Movement of the work piece is the key to this method. Larger parts over 200,000 lbs. and 80 feet in length can be hammered or pressed into shape this way. Open-die forging can produce forgings from a few pounds up to more than 150 tons. Called open-die because the metal is not confined laterally by impression dies during forging, this process progressively works the starting stock into the desired shape, most commonly between flat-faced dies. In practice, open-die forging comprises many process variations, permitting an extremely broad range of shapes and sizes to be produced. In fact, when design criteria dictate optimum structural integrity for a huge metal component, the sheer size capability of open-die forging makes it the clear process choice over non-forging alternatives. At the high end of the size range, open-die forgings are limited only by the size of the starting stock, namely, the largest ingot that can be cast. Practically all forgeable ferrous and non-ferrous alloys can be open-die forged, including some exotic materials like age-hardening superalloys and corrosion-resistant refractory alloys. Seamless rolled ring forging is typically performed by punching a hole in a thick, round piece of metal (creating a donut shape), and then rolling and squeezing (or in some cases, pounding) the donut into a thin ring. Ring diameters can be anywhere from a few inches to 30 feet. Rings forged by the seamless ring rolling process can weigh < 1 lb up to 350,000 lbs., while O.D.’s range from just a few inches up to 30-ft. in diameter. Performance-wise, there is no equal for forged, circular-cross-section rings used in energy generation, mining, aerospace, off-highway equipment and other critical applications. High tangential strength and ductility make forged rings well-suited for torque- and pressure-resistant components, such as gears, engine bearings for aircraft, wheel bearings, couplings, rotor spacers, sealed discs and cases, flanges, pressure vessels and valve bodies. Materials include not only carbon and alloy steels, but also non-ferrous alloys of aluminum, copper and titanium, as well as nickel-base superalloys. 800 398-4345 or submit the Request Information form on the right side of this page. Forged parts vary in size, shape and sophistication and can be produced using nearly any metal. The most common metals used include carbon, alloy, tool and stainless steels as well as aluminum, titanium, high-temperature superalloys, brass and copper. High strength-to-weight ratios and structural reliability favorably influence performance, range and payload capabilities in the aerospace industry. Made of ferrous, non-ferrous and special alloy materials, forgings are widely used in jets and piston-engine planes, helicopters, engine mounts, military aircraft and spacecraft. Some examples of where a forging's versatility of size, shape and properties make it an ideal component include bulkheads, wing roots and spars, hinges, engine mounts, brackets, beams, shafts, landing gear cylinders and struts, wheels, brake carriers and discs and arresting hooks. In jet turbine engines, iron-base, nickel-base and cobalt-base superalloys are forged into components such as discs, blades, buckets, couplings, manifolds, rings, chambers and shafts.